Hey guys, my name is Andrew Burns. I reside from the sun drenched city of Nelson. 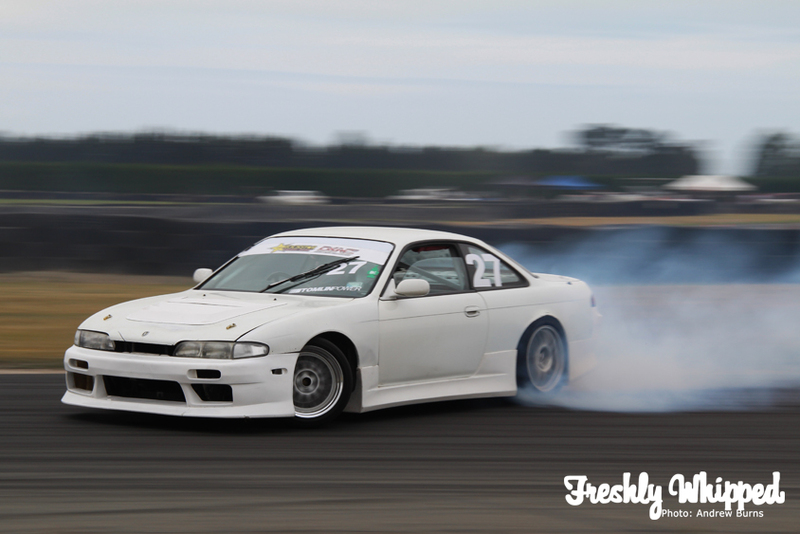 I’m a “motorsport enthusiast / car nut”, and enjoy anything with a motor and four wheels but drifting, Nissan’s and photography are what I enjoy most. 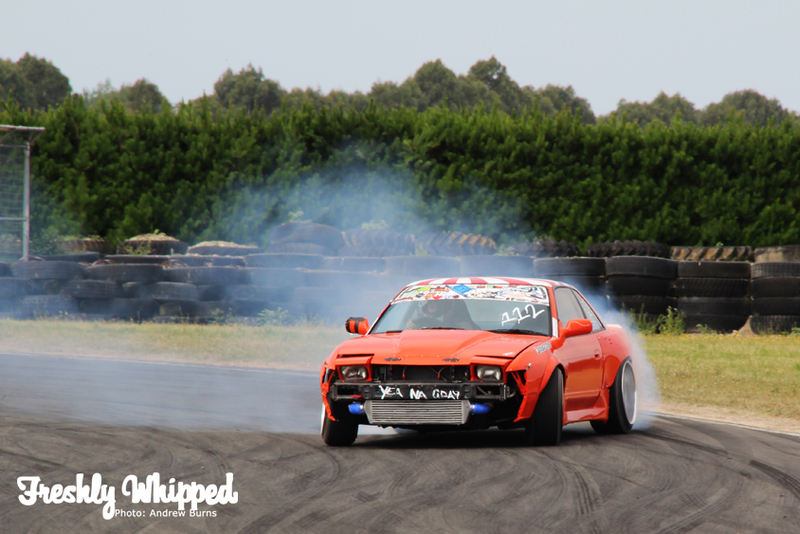 Enough about me on the drifting. 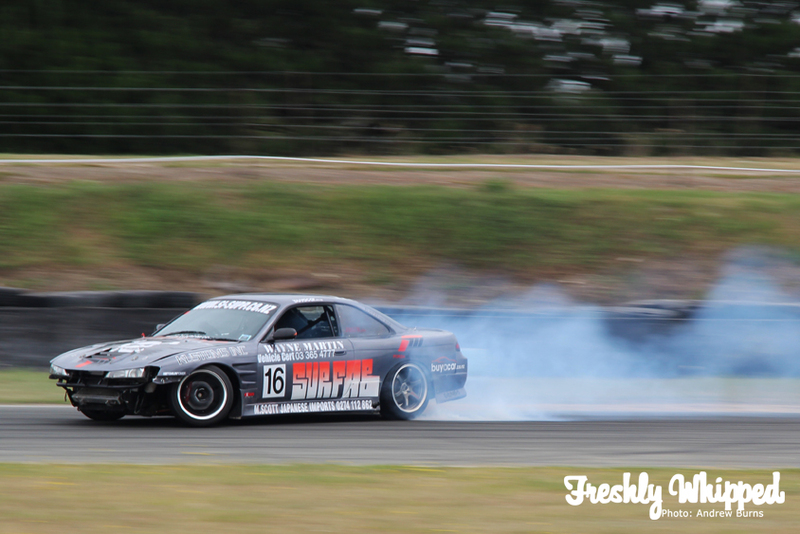 Drift South is New Zealand’s South Island drifting league. 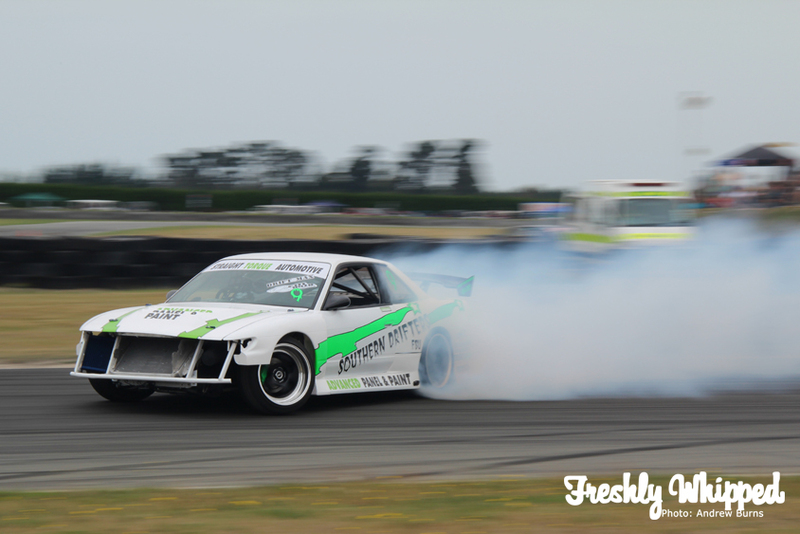 \r\n\r\nWe pick up the Drift South series at round 3 being held at Levels Raceway in Timaru. 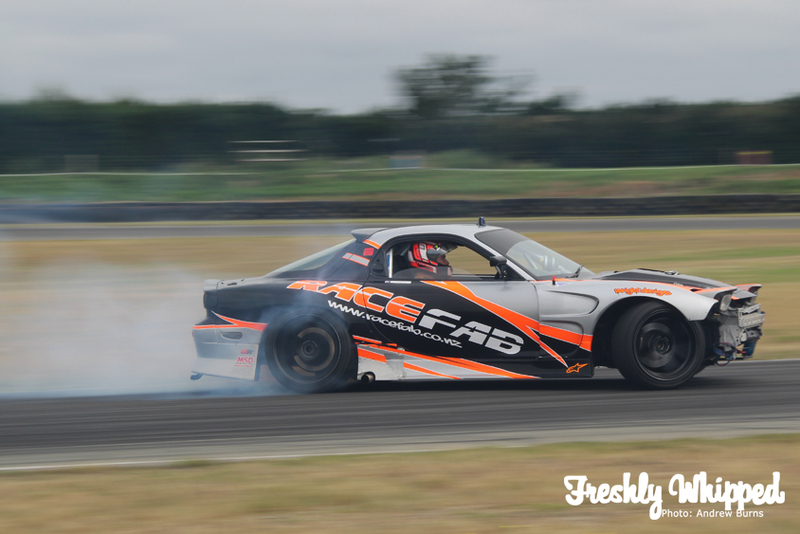 Johnny Latham’s RX7 really mixes it up. Not only is it the only batty in the series but also the only vehicle powered by a V8. 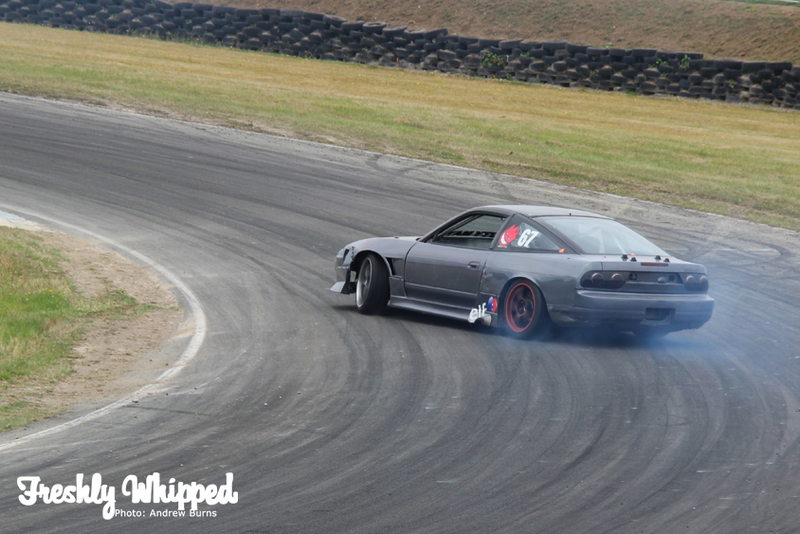 Running the car on ethanol for the first time this season, Oliver Biggs in his S14 was throwing some mad angle through the big sweeper. 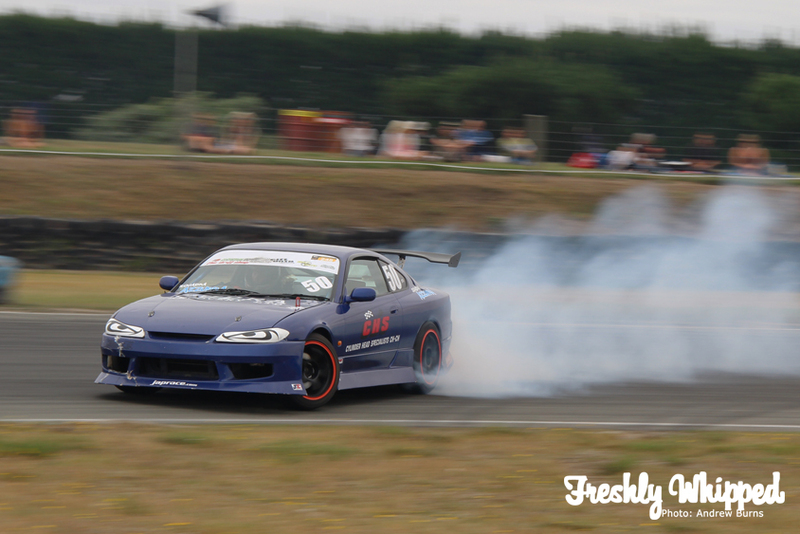 The car parks at events like this always have some pretty impressive rides in them. 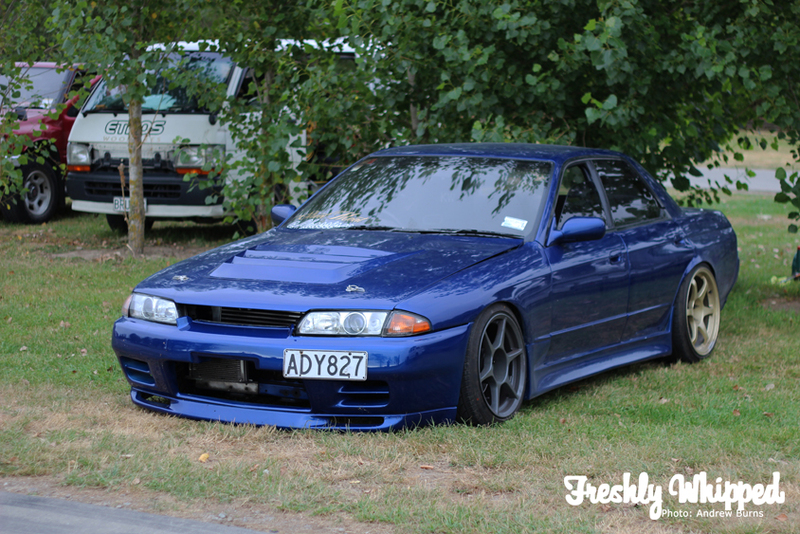 Love the colour of this four door R32. 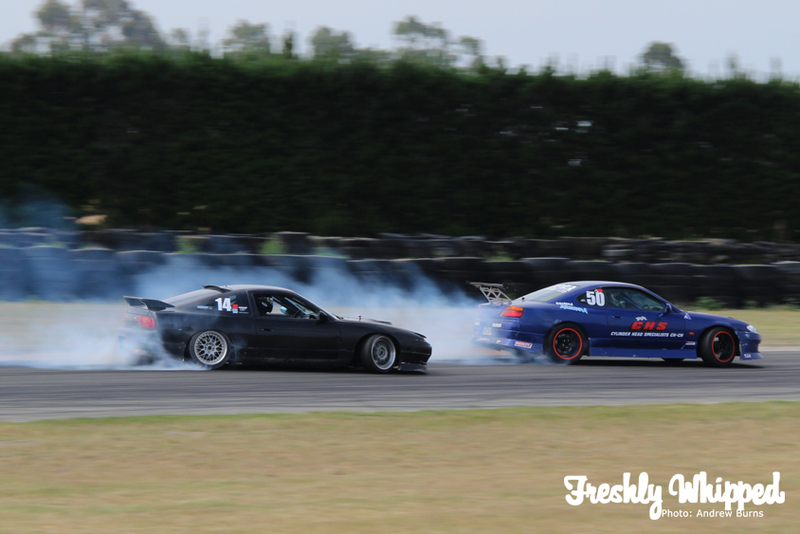 Choose your weapon 13, FD or 14? I’m a big fan of roof wings and .com’s wheels. 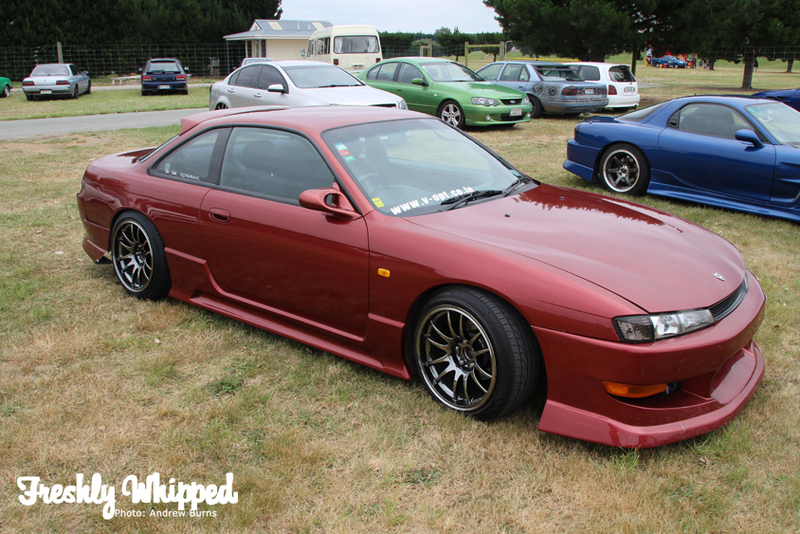 Very nice example of a street S14 facelift. 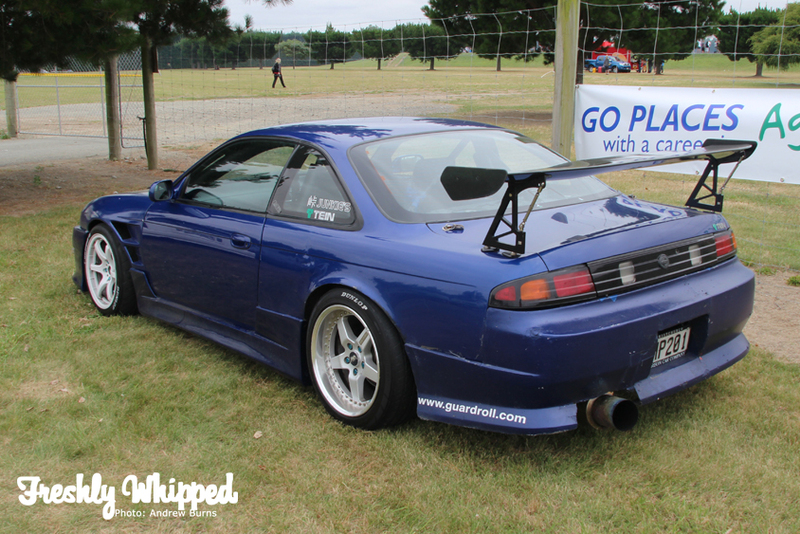 This Silvia looking like it would be more at home out on the track with its cage, wing and mismatched wheels. Only managing to get three practice laps in, Ollies’ gearbox wasn’t able to cope with the added horsepower but with a quick gearbox change Ollie was back out just in time for to qualify in 5th place. Drivers waiting patiently for drivers briefing, all of them keen to get out and burn some rubber. 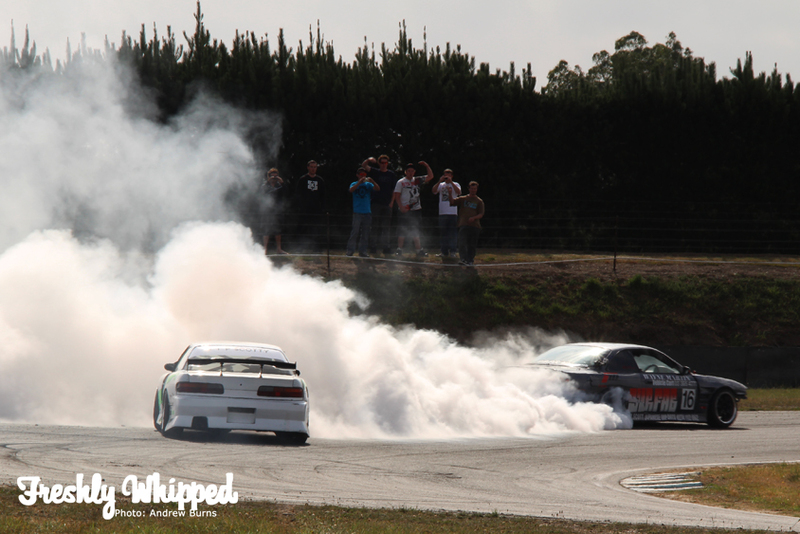 Lyndsay Lassen getting some good smoke with his new anti-lag tune, thanks to Rueban and team at Rapid Performance. 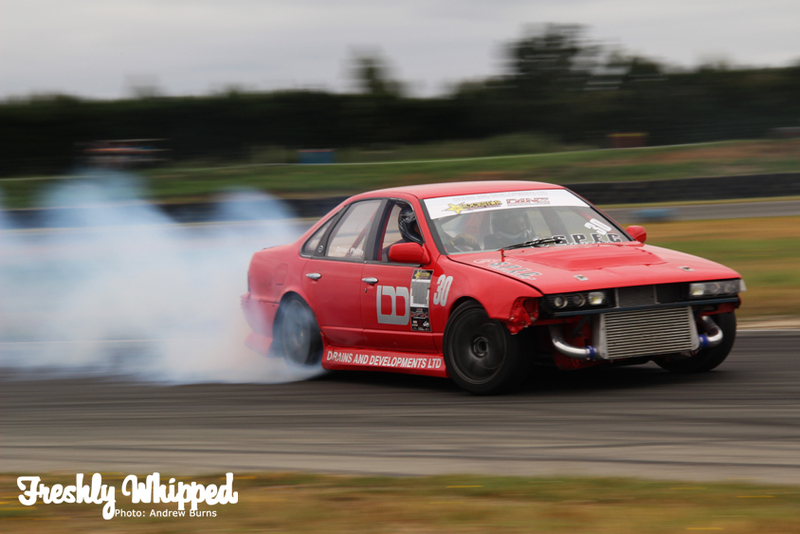 This mad Cefiro owned by Phillip Sutherland, not running the standard RB, but a heavily worked 2JZ. 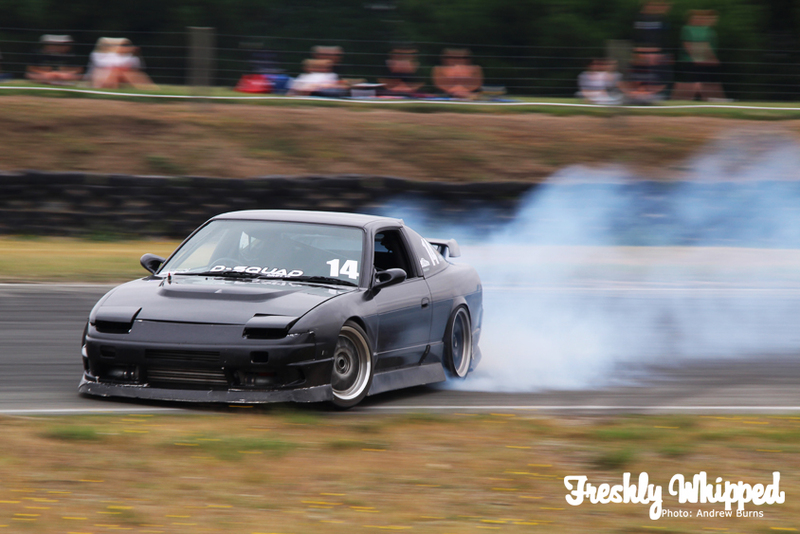 Not many CA18DETs in the field but Russel Majors s13 silvia has one and it gets thrown around with ease. GO THE CA! The perfect balance between form and function. Michael Ryder throwing down some clean lines during practice. 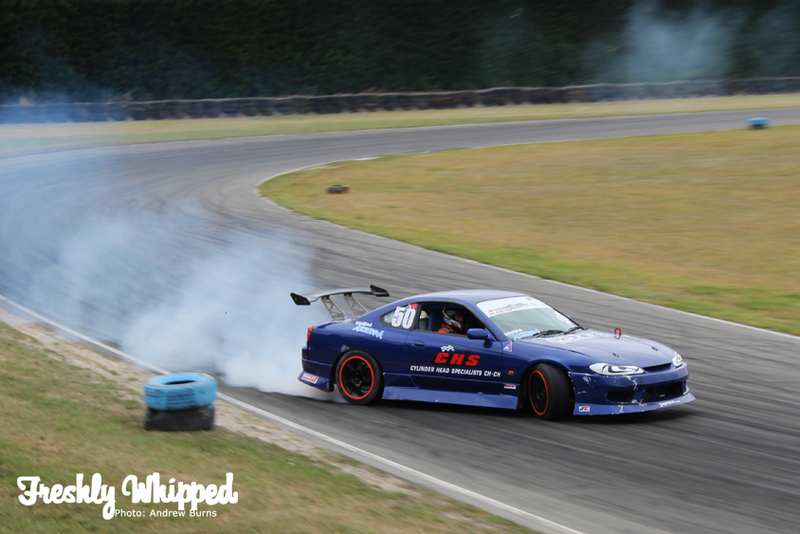 Mixing things up Brad Uran’s ultra tidy s15 being powered by a SR22. Buddy Club P1, Rota Grids and Works Emotion XD-9 – all class. 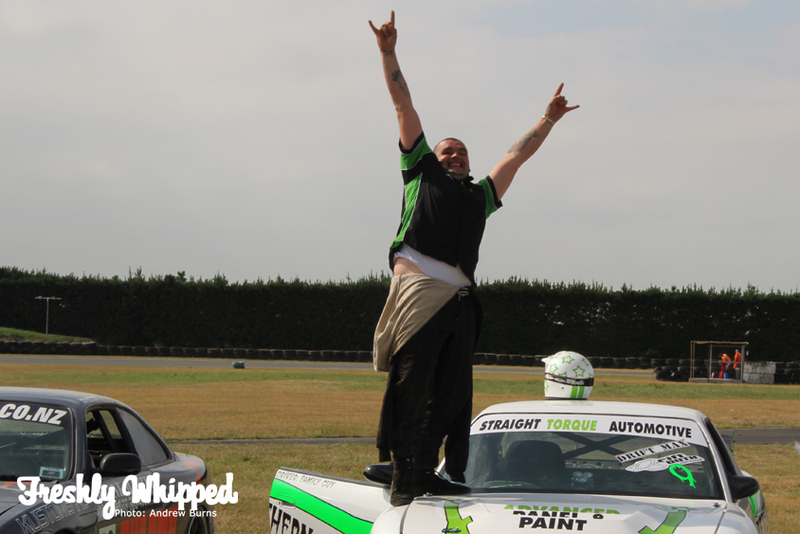 Car number 9 is piloted by Troy Forsythe a.k.a “family guy” as part of the Southern Drifters crew. 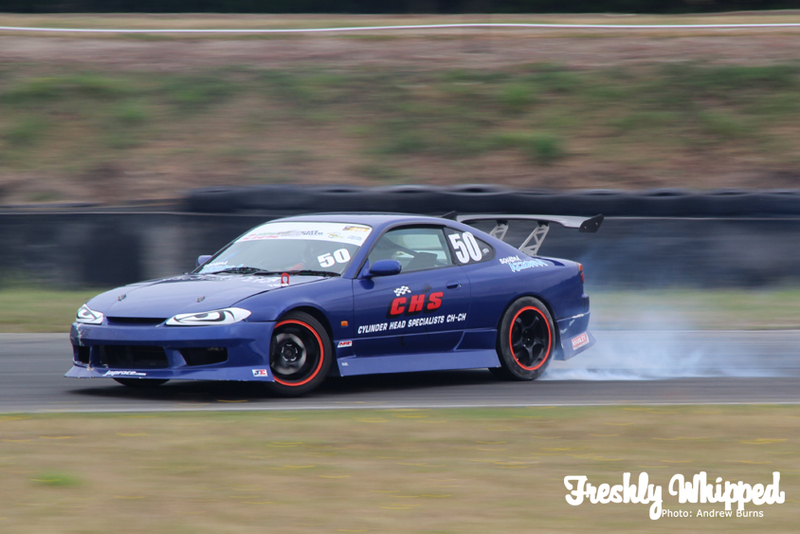 The Drift South scene is very grass roots, a lot of the drivers competing the whole season with little or no sponsors in most cases. 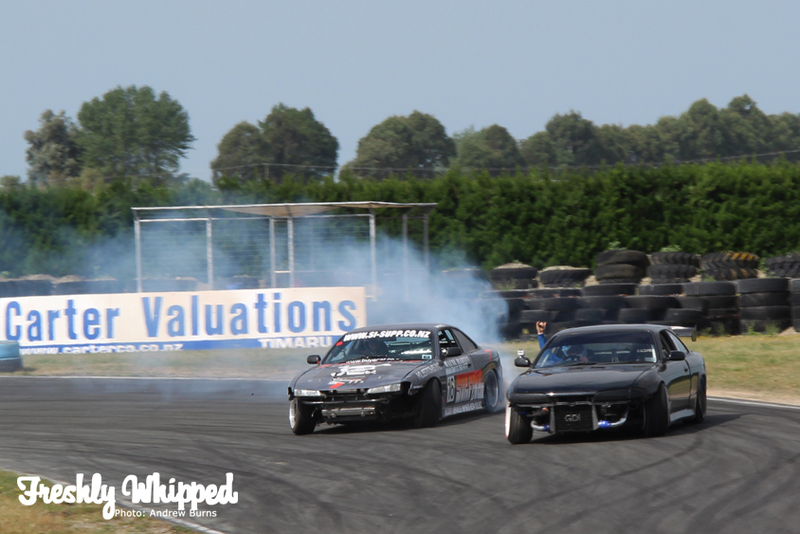 With all the rounds being held at Ruapuna except for this round, Level’s is a nice change of scenery for both driver and spectator. 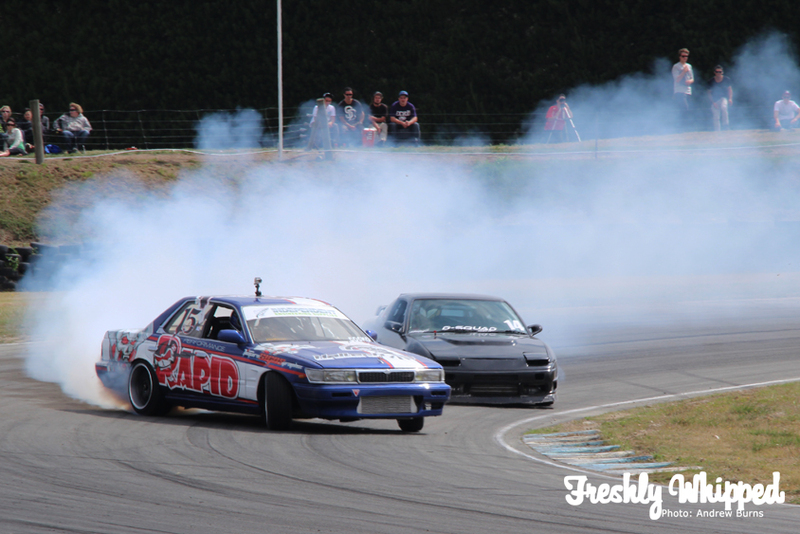 The entry is super fast, some cars hitting the 140 kph mark. 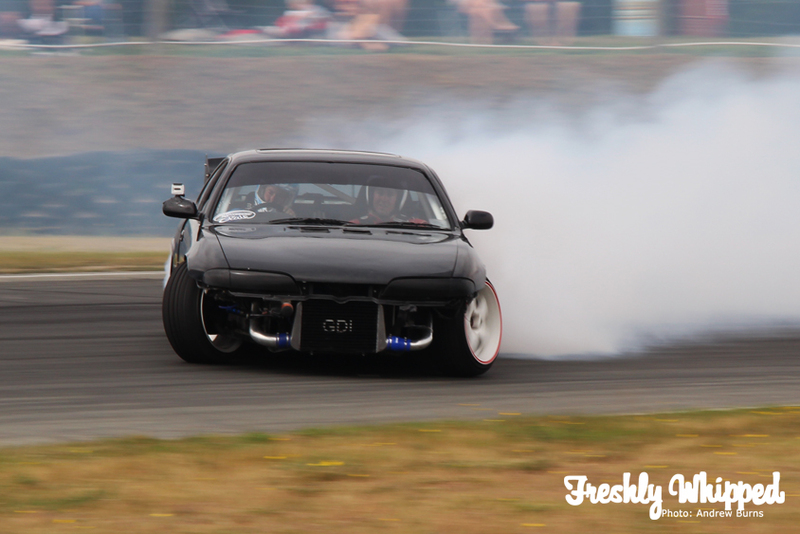 Gabba Read pushing the S13 hard. On to the battles. Mitchel Gibbs being hunted down by Chris Jackson. 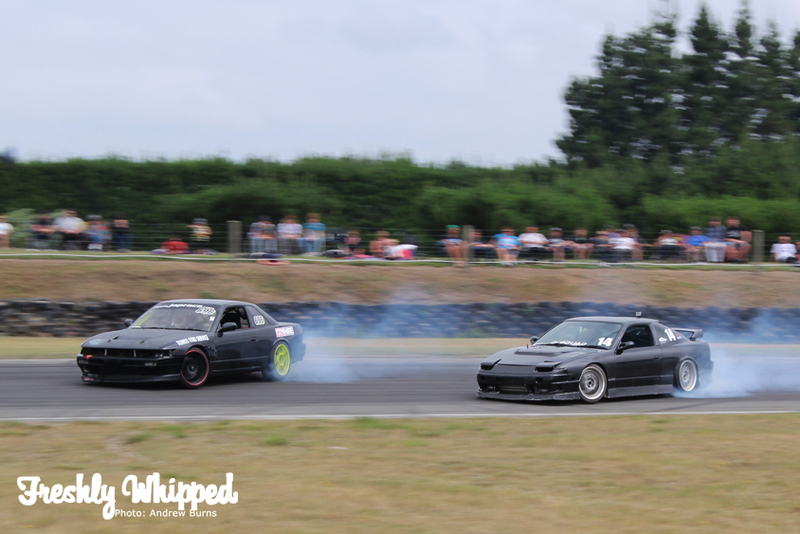 Both hard on the hand brake scrubbing speed. A bit of brotherly love. Blair Cochrane putting up a good battle against Mark. 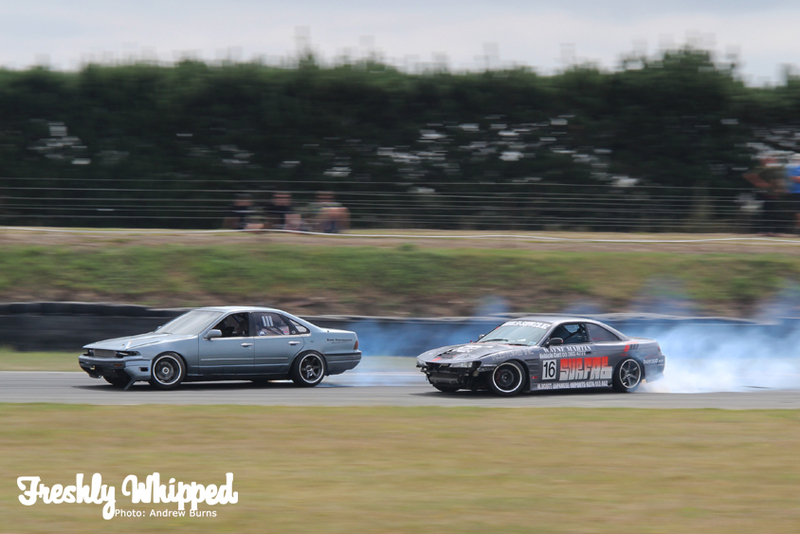 Oliver Biggs and Chris Jackson having to have a rebattle. The first two runs being too close to call. Chris taking the victory on the second run. 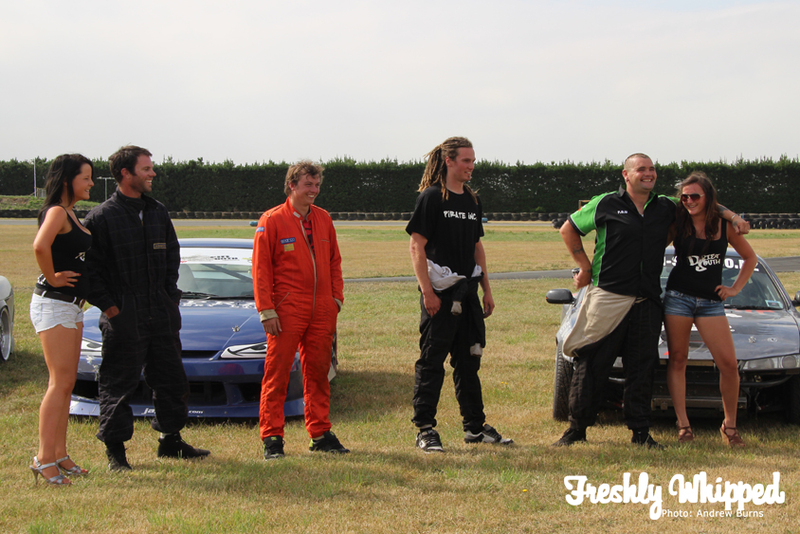 The winners podium – Mark OHara(3rd), Brad Uren (4th), Chris Jackson (2nd) and Troy Forsythe (1st). Troy taking his second win for the season. Jackson wasting no time in getting out and burning what he had left on his tires. Thats sick! 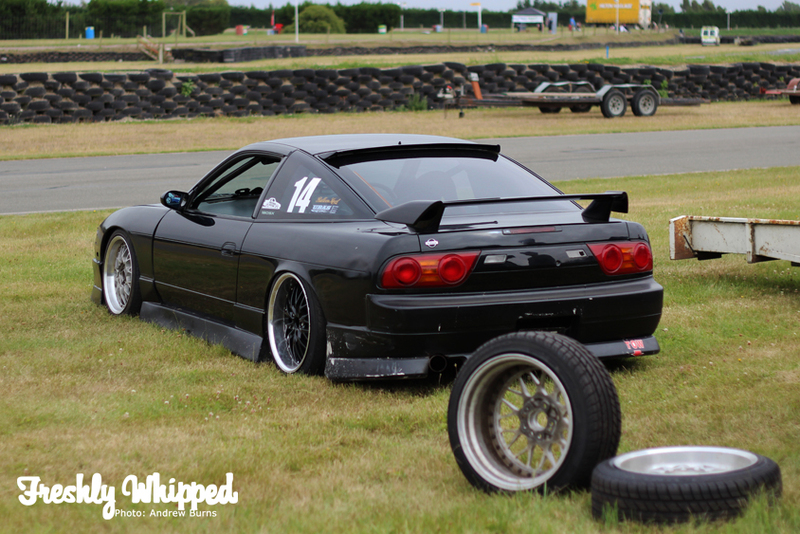 What wheels are on that ca18det s13? Best cars ive seen in ageeees! Fantastic photos Andrew. Very impressed!